Russian rabbi and author; born 1788; died at Minsk 1848. He was a descendant of R. Israel Jaffe of Shklov, author of "Or Yisrael." 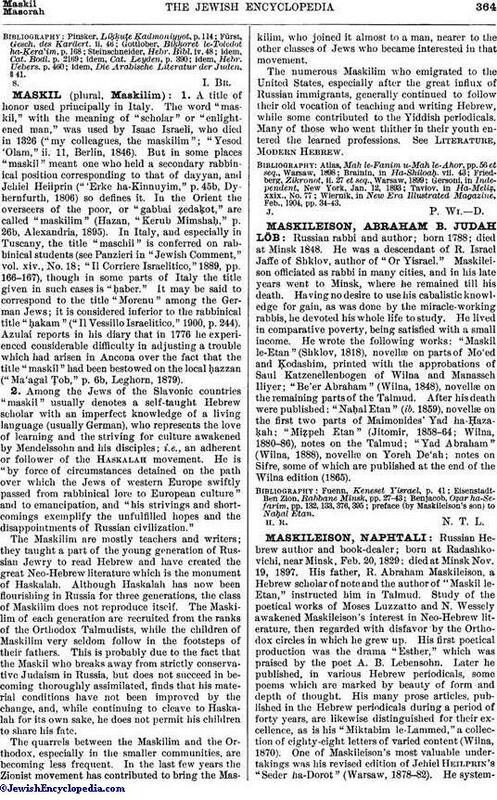 Maskileison ofliciated as rabbi in many cities, and in his late years went to Minsk, where he remained till his death. Having no desire to use his cabalistic knowledge for gain, as was done by the miracle-working rabbis, he devoted his whole life to study. He lived in comparative poverty, being satisfied with a small income. He wrote the following works: "Maskil le-Etan" (Shklov, 1818), novellæ on parts of Mo'ed and Ḳodashim, printed with the approbations of Saul Katzenellenbogen of Wilna and Manasseh Iliyer; "Be'er Abraham" (Wilna, 1848), novellæ on the remaining parts of the Talmud. After his death were published: "Naḥal Etan" (ib. 1859), novellæ on the first two parts of Maimonides' Yad ha-Ḥazaḳah; "Miẓpeh Etan" (Jitomir, 1858-64; Wilna, 1880-86), notes on the Talmud; "Yad Abraham" (Wilna, 1888), novellæ on Yoreh De'ah; notes on Sifre, some of which are published at the end of the Wilna edition (1865). preface (by Maskileison's son) to Naḥal Etan.